Tagline manufactures and stocks razor blade shelling paper in a width of 9/16″ and in 10pt and 15pt thicknesses. We work with rolls up to 22” O.D. and provide high quality, completely acid-free shelling paper so that razor blades won’t rust or corrode while inside the packaging. Additionally, Tagline’s equipment can process jumbo rolls of shelling paper which minimizes roll changes and reduces turnaround time. Typical shipping time frames are within one to two days for the US market. Both raw material and finished materials are always in stock and ready for processing. We will run to your packaging specifications, and for a stock program we can turn around your project in just a few days. Tagline’s suppliers are very responsive and able to provide samples for product testing. The razor blade boxes are constructed using American-made, acid-free, liner board to ensure product quality during storage. Standard sizes are available and produced with 8pt. coated one-side (C1s) board stock. Quick shipping is available for standard sizes. Tagline also produces custom made razor blade boxes and has the ability to print or customize the boxes with logos, safety information, etc. 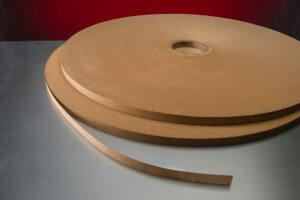 Tagline has extensive experience with coffee paper Toll Slitting applications. In this example, the customer supplied the coffee paper for processing to their specifications. The required I.D. was 1.18inch / 30mm. Coffee filter paper is very flexible, tears easily, and is not typically easy to run through a slitting process. We were able to successfully run this project, saving the customer save time and money. Tagline operators are highly trained and experienced to set up the slitting machines and run this type of coffee filter paper. Additionally, Tagline maintains a stocking program with delivery service for the customer, so inventory is managed in conjunction with production needs. For shipping, each roll must be shrink wrapped and put into an inner bag. 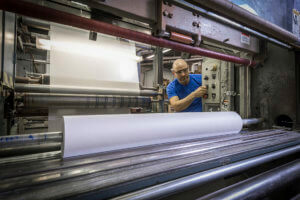 Due to extensive handling in a clean environment, multiple forms of packaging are required to protect the coffee paper from damage and contaminants.